Who invented the Internet? The names of the men most frequently credited with inventing the Internet are the American computer scientists Vinton Cerf and Robert E. Kahn who developed the Transmission Control Protocol (TCP) and the Internet Protocol (IP) in 1973. However, the invention of the Internet would not have been possible without the ideas, inventions, developments and contributions of many other brilliant computer scientists. This article provides a timeline of the key inventions and the names of the men who have transported people into the age of Information and Technology. Who invented the Internet? The names of the amazing computer scientists who made major contributions to the development of the Internet are Leonard Kleinrock, J.C.R. "Lick" Licklider, Donald Davies, Paul Baran, Ray Tomlinson, Robert E. Kahn, Vinton Cerf, Bob Metcalfe, Dennis Hayes, Dale Heatherington, Paul Mockapetris, Jon Postel and Tim Berners-Lee. These are the men who invented the Internet. Definition of the Internet: The Internet is defined as a global system of thousands of computers and interconnected computer networks that are joined together by a common communications protocol, for transmitting and receiving information, and connected by gateways. The Internet, described as the "information superhighway", provides access to the World Wide Web for transmission of website pages, e-mails, files and similar electronic data. None of this would have happened without the Invention of the Computer by Charles Babbage in 1837 and the ground-breaking work on computers by Alan Turing and his Turing Machine. Who owns the Internet? Unlike the various telecommunications networks the Internet has no owner. 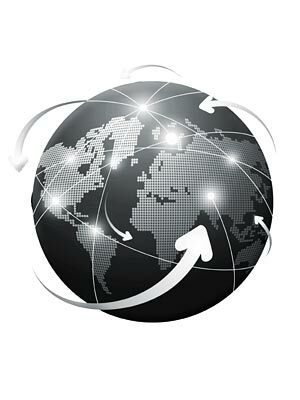 The internet consists of a federation of service providers and educational networks. To become part of the Internet and start communicating a person only needs to connect a computer to a port on a service provider's router and obtain an IP address. Fact 1: Who invented the Internet? Prior to the invention of the Internet and the World Wide Web, books and libraries were the only source of information, trips to banks and shops were necessary, news was available via the TV and radio and we communicated with each other by telephone, sending letters or meeting people face to face. We used paper maps to find our way around and music was sold on CD's or vinyl. Fact 2: Who invented the Internet? The invention of the Internet changed the world and the way we live and provides access to the World Wide Web. The terms Internet and World Wide Web are often used without distinction but the two are not the same, as can be seen by the above definition. Fact 3: Who invented the Internet? ARPA / DARPA: The invention of the Internet began in 1958 when the United States Department of Defense established an agency called ARPA short for the Advanced Research Projects Agency. ARPA was established by the United States during the Cold War in response to the Soviet launching of Sputnik 1 in 1957 to expand the frontiers of technology and science. The name of the ARPA organization changed several times notably to DARPA short for the Defense Advanced Research Projects Agency. The primary mission of ARPA was to ensure that U.S. military technology would be more advanced than that of the nation's enemies. Fact 4: Who invented the Internet? ARPANET: The Advanced Research Projects Agency (ARPA) underwrote development for the precursor of the Internet, known as ARPA-NET. "ARPANET" was the original name of the Internet. Fact 5: Who invented the Internet? Leonard Kleinrock: The first ideas for the 'Internet' began to surface when computer scientist Leonard Kleinrock published a paper entitled "Information Flow in Large Communication Nets" on May 31, 1961. Fact 6: Who invented the Internet? J.C.R. "Lick" Licklider: In August 1962 J.C.R. "Lick" Licklider (1915 - 1990) of Massachusetts Institute of Technology (MIT) wrote a series of memos discussing the concept of a "Galactic Network" on which the Internet would be based. Fact 7: Who invented the Internet? ARPANET: The Advanced Research Projects Agency Network (ARPANET) began as a modest network of four interconnected university computers that incorporated the concept of 'Packet switching' that was designed to enable its users at different locations to communicate and share resources. Fact 8: Who invented the Internet? In October 1962 J.C.R. "Lick" Licklider was appointed head of the ARPANET computer network development program and Leonard Kleinrock established a laboratory at the University of California (UCLA). Fact 9: Who invented the Internet? UCLA, SRI, UCSB & UTAH: Four Computer labs were set up during the development of the ARPANET. Their locations were at the University of California, Los Angeles (UCLA), Stanford Research Institute (SRI), the University of California, Santa Barbara (UCSB) and the University of Utah. Fact 10: Who invented the Internet? NCP: Computer Scientists working on the ARPANET developed core networking protocols called the Network Control Program (NCP) that connected processes running on different computers. Fact 11: Who invented the Internet? Packet Switching: The new idea and concept of 'Packet switching' was developed completely separately from the ARPANET by British computer scientist Donald Davies (1924 - 2000) and Paul Baran (1926 - 2011) an American computer networking engineer. 'Packet switching' was a method of breaking digital message files into small packets. The concept of 'Packet switching' was a major breakthrough in computer technology. Fact 12: Who invented the Internet? : In 1966 ARPANET adopted the new idea of Packet switching creating a small computer network for scientists and researchers at UCLA, SRI, UCSB and the University of Utah that enabled them to share one another's computers remotely. Fact 13: Who invented the Internet? First Internet message: The first Internet message was sent over the ARPANET from a computer in Leonard Kleinrock's laboratory at UCLA to a computer at SRI on Friday October 29, 1969 at 10:30 p.m. The first transmission just said "LO" - which was sent as an attempt at "LOGIN" by Charley S. Kline, a computer scientist who studied at UCLA under Leonard Kleinrock. However the SRI system crashed before a full message could be sent. The problem was soon resolved and work on the Internet continued. Fact 14: Who invented the Internet? Ray Tomlinson and E-Mail: The invention of the modern Internet took another leap forward in 1971 when Ray Tomlinson (1941 - 2016) developed E-mail on the ARPANET system. Fact 15: Who invented the Internet? Robert E. Kahn and Vinton Cerf: In 1973 Dr. Vinton Cerf and Dr. Robert Kahn co-invented software code that is used to transmit data over the Internet referred to as TCP/IP. The Transmission Control Protocol (TCP) and the Internet Protocol (IP) replaced the earlier NCP protocol and formed the basic architecture of the modern Internet. TCP/IP set standards for how data could be transmitted between multiple networks and is still the primary protocol used on the Internet. The prominent role of TCP/IP on modern networks have led many people to name Robert E. Kahn and Vinton Cerf as the inventors of the Internet. Fact 16: Who invented the Internet? Telenet: In 1974 developed the first commercial version of the ARPANET called "Telenet" was introduced and considered to be the first Internet Service Provider (ISP). Fact 17: Who invented the Internet? Bob Metcalfe and Ethernet: In 1973 Bob Metcalfe developed the idea of Ethernet as a standard way to connect computers on a network over a wired connection providing a simple interface for connecting multiple devices, such computers, routers, and switches. Fact 18: Who invented the Internet? The Modem: In 1977 Dennis Hayes and Dale Heatherington released the 80-103A Modem (from MOdulator-DEModulator) and went on to play a major role in the explosion of the internet. Fact 19: Who invented the Internet? MILNET: In 1983 MILNET was created separating the Military Network from the ARPANET. Fact 20: Who invented the Internet? DNS: In 1984 Paul Mockapetris and Jon Postel introduced the concept of "domain names" requiring "Domain Name Servers". Prior to 1984 all computers were just addressed by their IP addresses consisting of numbers. Fact 21: Who invented the Internet? In 1989, the name "ARPANET" was retired in favor of the term "Internet". Fact 22: Who invented the Internet? Tim Berners-Lee - HTML & URL: In 1990 Tim Berners-Lee developed HTML (HyperText Markup Language), the authoring language used to create electronic documents, and the uniform resource locator (URL). These two key inventions enabled Tim Berners-Lee to create the World Wide Web (WWW). Tim Berners-Lee publicly introduced World Wide Web on August 6, 1991. Fact 23: Who invented the Internet? World Wide Web: The World Wide Web is a branch of the Internet which is entered via a computer providing people access to text, sound, graphics and animation resources across the globe. The development of the Internet and the World Wide Web heralded the start of the Technology and Information Age. The invention of the Smartphone took a massive leap in 2007 when the iPhone was launched by Steve Jobs making the World Wide Web accessible while people were on the move, changing our way of life forever.